Home|ROW Projects|Artwork, Books, Video|Whose Forest Is It? This short video captures the spirit and sequence of a River of Words investigation with 1stand 2nd graders, Ryan Road School, Florence, MA. Watch children walking, exploring and sitting quietly in the woods collecting words and images. Follow them back into the classroom where they paint watercolors, write poems and share their creations. 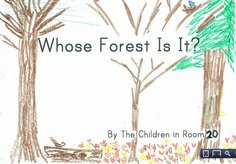 The video concludes with the collaboratively written and illustrated book, “Whose Forest Is It?” Many thanks to Mount Holyoke student Gerlisa Garre who filmed this video and accompanied the children on their environmental investigations. Andrea Egitto adapted the pilot lesson “Whose Garden Is It?” for First Graders at Ryan Road School who took several field trips to the nearby Sawmill Hills Conservation Area. Check out the book they created.